The Tuva Supreme Court sentenced Ertine Salchak, 20, to 25 years in prison for the murder of two little children in the village of Bai-Khaak, the Tandy district of the republic in 2006. He will serve his sentence in a tough-regime penitentiary, press secretary of the Tuva republican Prosecutor’s Office Vasily Krivdik told Itar-Tass on Friday. On November, 17th participants of the archaeological expedition on preserving the cultural heritage monument Por-Bajin met in the Academy of Civil Protection of EMERCOM. The event collected students from Moscow, St.-Petersburg, Kazan, Tuva State universities, Krasnoyarsk State Pedagogical University, and also leading experts from various Russian and foreign scientific organizations. On November, 2, 2007 the Coordination Council of the preservation project of the cultural monument of federal value - fortress "Por-Bazhyn" took place. The following persons participated in the meeting: deputy director on scientific works at the State Museum of Peoples' Arts of the East T.K. Mkrtychev, director of the Archeological department of the Ancient and Medieval East at the Institute of Ethnology and Anthropology of the Russian Academy of Sciences I.A. Arzhantseva, senior scientific co-worker of the Institute of Material Culture V. A Zavyalov, senior lecturer of the Geological faculty of the Lomonosov Moscow State University I.N. Modin, first category restorer of the State Scientific Research Institute of Restoration G.E. Veresotskaya, and main architect of Regional Architectural Art Fund R. A. Vafiev. 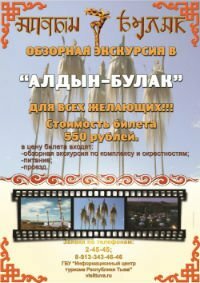 After over 2 years of 'air isolation' Tuva is again connected with the Russian capital via air connection. The Moscow-Kyzyl flight has been restarted on November 4, departing from Moscow at 11.50 p.m and arriving in Kyzyl the next day at noon (local time). 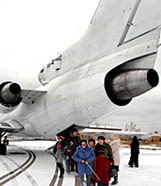 The first after a long interval flight was received in Kyzyl by Tuva's prime-minister Sholban Kara-ool who greeted the air-plane crew in the Kyzyl airport and presented the stewardesses with flowers. 'It is more than important for Tuva to be open and accessible. We set a task to develop transport infrastructure and we are gradually implementing it', - Mr Kara-ool stressed.